The American Psychiatric Association Diagnostic and Statistical Manual for Mental Disorders, fourth edition (DSM-IV) defines that bipolar disorder is a chronic and recurrent mood disorder characterized by episodes of depression and of Mania. "There is evidence from imaging studies that the brains of people with bipolar disorder may differ from the brains of healthy individuals." Bipolar disorder is one of the most widely spread mental illness; it is considered as a state of re-occurrence and persistent destabilization of a person's mood. Bipolar disorder is also known as Manic Depressive Illness because it usually showcases itself in a series of depression (low mood) and Mania. When the illness involves recurrent situations of mania and depressions. When it involves milder states of mania and more severe situations of depression and or hypoMania. 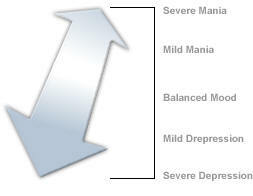 When the situation is rapidly changing, and reaching a minimum of four series of mood changes within 12 months. Though it typically develops in adolescent stage of a person first symptoms may occur during childhood. This illness poses a potential threat to the future of the society and of the world at large because it is one of the lead causes of suicide and it is currently not detectable by physiological medical diagnosis (through blood or brain scan). This illness poses a potential threat to the future of the society and of the world at large because it is one of the lead causes of suicide and it is currently not detectable by physiological medical diagnosis (through blood or brain scan). Due to the fact that this bipolar disorder tend to run through families there had been much speculations that it might be a heritage disease and obviously transferred only through genes This has lead to various research and findings on actual cause of this disease. The research involved searching for specific genes Inside cells that plays significant roles in controlling the activities of the mind and body. One of the researches, was built around the study of the disorder in an identical twin of a father with the illness, shows that though genes plays a role in causing the disease, it has also combined with some other factors which include the social and physical environments, to cause bipolar disorder. The research evidently reveals that bipolar disorder was dependant on genes and heredity factors, however those are not the entire factors that affects the transfer of the disease. This fact was established with the fact the the twins that came from a parent suffering from bipolar disorder, didn't suffer the disease, however it was also established that since of the the twins suffered the disorder, his immediate twin sibling as more possibility of suffering from the disorder than any other sibling. Poor school or work performance, alcohol or drug abuse, bad interpersonal relationships to name but a few might be signs of an underlying mood disorder which indicates possibilities of bipolar disorder. The fast ideas become too fast and there are far too many... overwhelming confusion replaces clarity... you stop keeping up with it - memory goes. Infectious humor ceases to amuse. Your friends become frightened... everything is now against the grain... you are irritable, angry, frightened, uncontrollable, and trapped. In addition, mood disturbance causes marked impairment in occupational or social domain; or is accompanied by psychosis. I doubt completely my ability to do anything well. It seems as though my mind has slowed down and burned out to the point of being virtually useless... (I am) haunt(ed)... with the total, the desperate hopelessness of it all... Others say, "It's only temporary, it will pass, you will get over it," but of course they haven't any idea of how I feel, although they are certain they do. If I can't feel, move, think or care, then what on earth is the point? At first when I'm high, it's tremendous... ideas are fast... like shooting stars you follow until brighter ones appear... All shyness disappears, the right words and gestures are suddenly there... uninteresting people, things become intensely interesting. Sensuality is pervasive; the desire to seduce and be seduced is irresistible. Your marrow is infused with unbelievable feelings of ease, power, well-being, omnipotence, euphoria... you can do anything... but, somewhere this changes. In a situation where the mania occurs to an average level, hypomania occurs and this is usually associated with good functioning and increase productivity, however hypomania ( if not properly treated )result in a severe depression or mania strike, which is quite dangerous to health. Retrieved 19th December 2005 from: National Institutes of Health, US Department of Health and Human Services 2003 (NIH Publication Number: NIH 5124). Brent, D. A., Perper, J. A., Goldstein, C. E., Kolko, D. J., Allan, M. J., Allman, C. J., and Zelenak, J. P. Arch Gen Psychiatry 45, 581-588, 1988. Murray CJL, Lopez AD, eds. Cambridge, MA: Published by the Harvard School of Public Health on behalf of the World Health Organization and the World Bank, Harvard University Press, 1996.